Members of MikeBrownSucks.com held a presentation ceremony for the "100-200 Futility Award," December 26, 2010 at Molly Malone's Irish Pub and Restaurant. 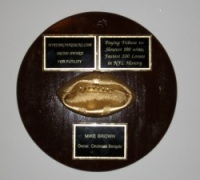 Mike Brown, president and CEO of the Cincinnati Bengals NFL franchise was the winner of this prestigious award, landing him atop the pantheon of insensate figures who exemplify gross underachievement and mismanagement. MikeBrownSucks.com would also like to thank some of our founding members who joined the cause nearly a decade ago. To those who are here, we thank you. For those we haven't heard from, please stop by. For those who have gone on, God bless you. "This is Turdbucket signing off for the final time. It was a good ride with all you guys. I'm not going to mention anyone except Fraidy, Dunn, CMBH, Murf and Storm. I really enjoyed my time talking with everyone. Honestly, I have been given a 2 month chance of survival and not many days after that if I make it. After many, many surgeries for my ongoing lung and liver problems I will only tell you to live life to it's fullest. My lungs are kapoot, too many years of hard living and smoking, not to mention the bourbon. By the way, did I mention the bourbon? One of my final wish is that all you boys can enjoy a Super Bowl win very soon. Tomorrow I enter the City of Hope hospice for my final days. I will root for all you guys on the other side. Tearfully, I say cheers to everyone, you've been great.